The creep curves are plotted in between time and strains for specified temperature and stress. One typical curve is represented in following figure for constant stress σ and temperature T.
To start along with the test piece is loaded at point O such consequent to zero time and zero strain. Immediately after application of stress the test piece suffers from elastic strain upto point A. Since the time passes the test piece continues to extend along with decreasing rate upto point B and along with a constant rate from B to C. From C point the rate of raise of creep strain raises upto point D, here the fracture or rupture takes place. Though the creep curve description appears to be rather simple, the set of data occupies complicated manage, recording and measurement system. The significant point to note is that the whole time required may be very large in the creep curve, ranging from a few months to as long as 10 years. The instruments are hold to be working throughout his time. Usually a battery of machines is needs to make instantaneous studies at various stress levels and temperatures. Conveniently a creep curve is divided into three stages. The primary stage of creep extends from point A to B, this covers a minute part of whole period. The creep throughout this stage is often referred to like transition creep and rate of creep decreases due to strain of material hardening. From B to C, this can be seen, rate of creep is constant. This is termed as stage II or creep and is recognized by its constant rate. Throughout this stage minimum constant creep rate is acquired. This steady state creep is the conclusion of balance in between two effects of strain softening and hardening caused by temperature. In service conditions more machine parts that are needed to have infinite life work in secondary creep zone. The tertiary or final creep from point C is marked along with increasing creep rate finally culminating into separation or rupture of test piece into two pieces. It is known as stage III of creep. It might be pointed out there that throughout tertiary creep the necking takes also place that increases effective stress and hence rate of strain also rises. 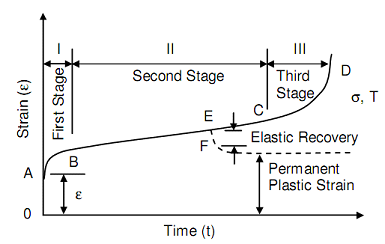 If creep load is eliminated at any point like E throughout stage II then instantaneous elastic recovery takes place as represented from E to F. It is followed via a gradual strain recovery to permanent strain that does not recover at all as in figure of Characteristic Creep Curves at Stress and Temperature T.